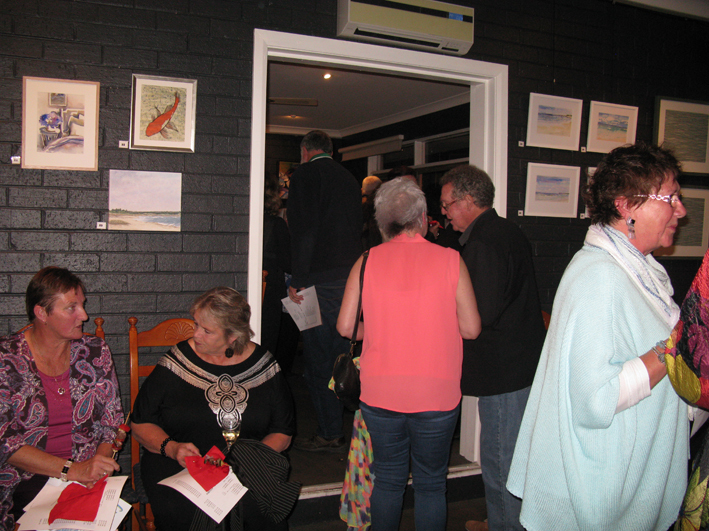 ‘Liquid Life’ Exhibition Opening Night Success! 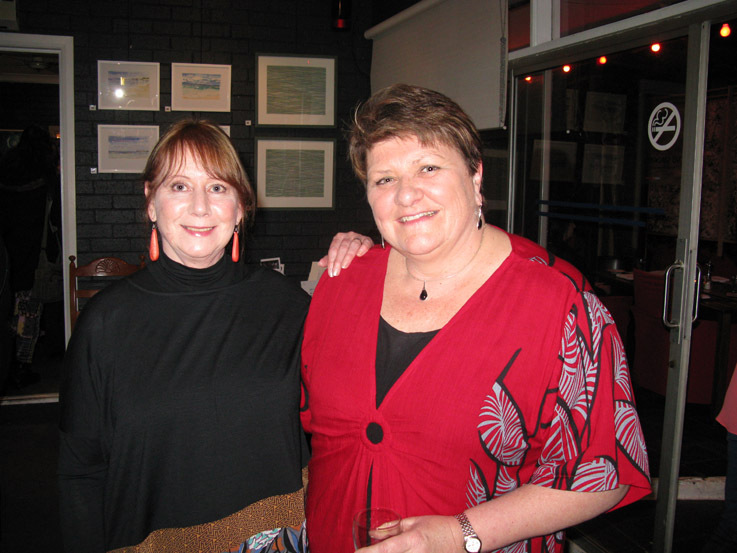 Tuesday 1 September, was the opening night for LIQUID LIFE, a joint exhibition with my cousin and Central Coast artist, Tracey Scheitel at the Shorethyme Restaurant & Gallery at Norah Head on the NSW Central Coast. The evening was a great success with a big crowd attending for the opening drinks and following dinner. 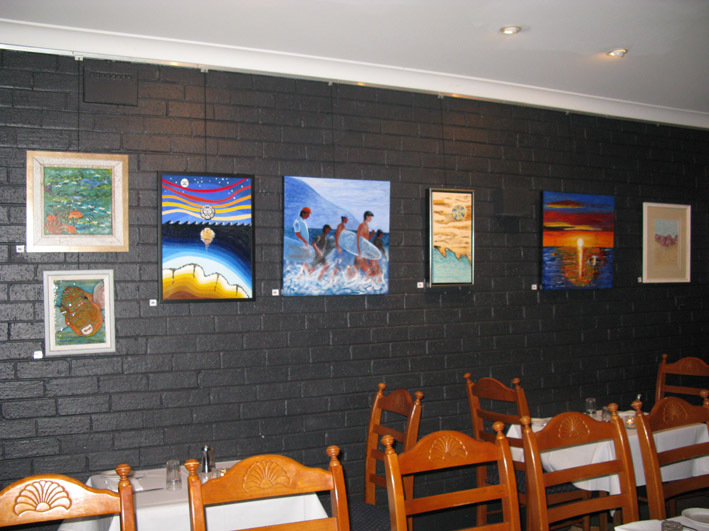 Tracey and I have very contrasting styles so having my artwork displayed altogether in one room of the restaurant and all of Tracey’s in the adjoining room worked out to be a really good way of displaying all our work. Despite our artwork looking quite different, to tie everything together this exhibition has been inspired by the theme of water – Liquid Life – in our daily lives and all around us and includes watercolours, acrylics, pencil drawings, linocuts and mixed media. 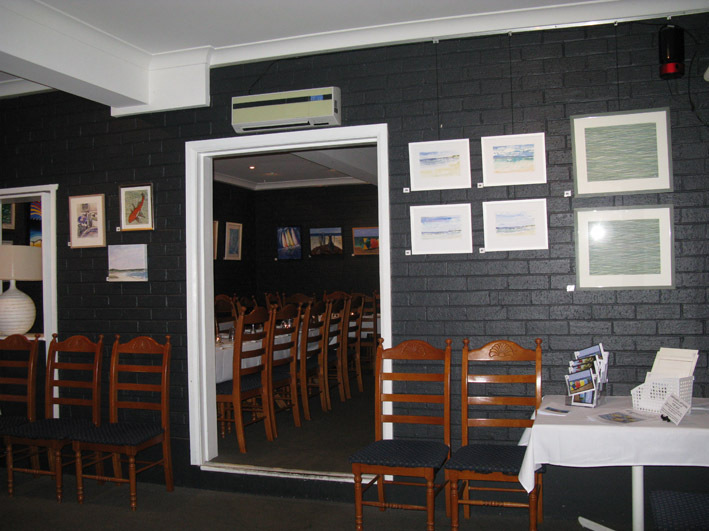 The exhibition will be showing from 1 – 13 September 2015 at Shorethyme Restaurant & Gallery at 9 Mitchell Street, Norah Head on the NSW Central Coast, 4396 4507. Gallery hours: Tuesday to Saturday from 2pm (till restaurant closes in the evening), 9 – 4pm on Sundays. Here is a photo taken of myself and Tracey (in red) on opening night, looking very happy that after all our hard work over the last few months the exhibition has finally opened! 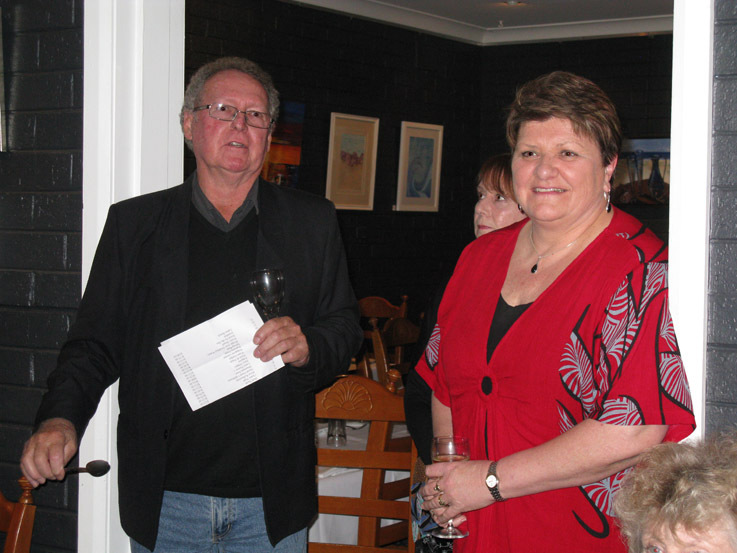 Chris Downes, owner of Shorethyme and an artist himself, officially opening the exhibition for us. Some of the guests enjoying opening night drinks. 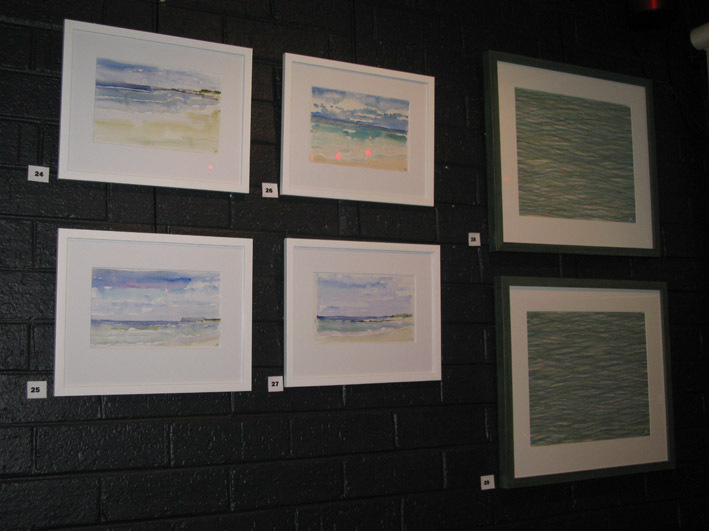 One of the walls in the restaurant displaying my work. Another wall featuring some of my work. 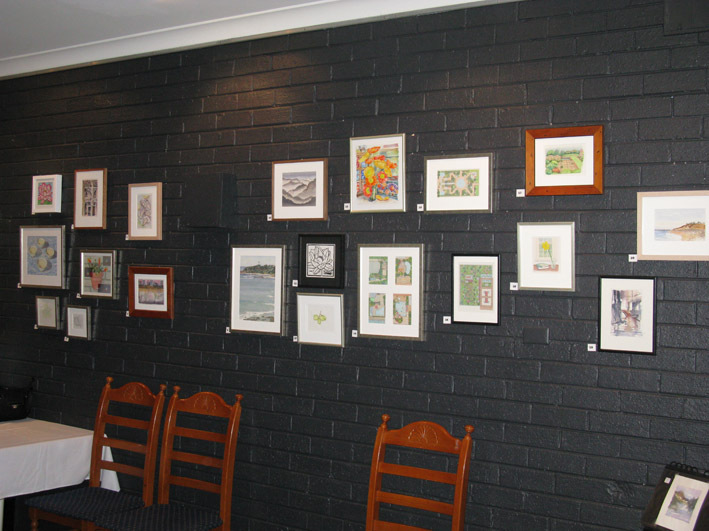 Another view of the room displaying my work with a glimpse of Tracey’s artwork in the adjoining room. Some examples of Tracey’s striking acrylic images.